Casa Marco is beautiful one bedroom rural cottage situated in the town of Armenime in the South of Tenerife. It has it's own private pool with amazing sea views, which can be enjoyed from both the house and the sun terraces and pool. 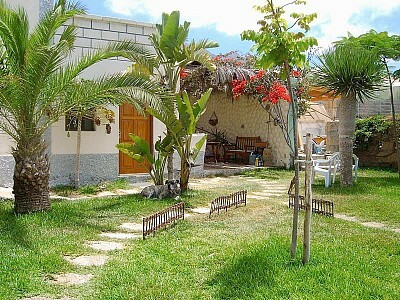 There is also a large, mature and well maintained garden with sub-tropical plants. The pool uses a special cleaning process, which means that it does not use chlorine and other chemicals. The house is laid out over 3 floors, with the well equipped kitchen/dining room and bathroom on the ground floor. A few steps lead up to the styllish Canarian style living room/bedroom, which consists of 2 single beds which have been pushed together and with a mosquito net. There is also a pull-out sofa bed and 2 cosy chairs. This room has 4 metre high ceilings, like a gallery and is decorated in Castillian style. A beautiful wooden staircase leads from her up to the roof terrace, with high walls for privacy and furnished with table and chairs.